the super cool Crafty Supermarket event on November 19th, 2011 in Cincinnati is looking for crafters! the application deadline is September 1st! Are you an artist seeking an eastside studio? There are currently two artists looking to share a space on Larchmere with another two artists. Rent will be less than $250/month. Interested? Please contact Nancy by email. Different Things Gallery will be hosting a Halloween Hay Day in the Fairview Park Shopping Plaza with games, contests, family acttivities live music and lots more. 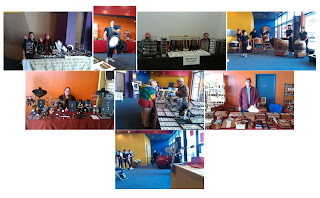 Art and craft sellers will present their handmade items inside the spacious former Blockbuster video location. Please contact Chris Young at dtgallery@live.com or 216 370 2414 for an application. Applications will be due October 15th, 2011.